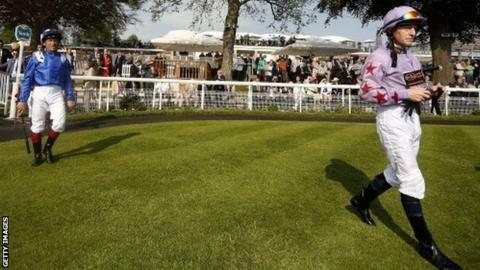 Kieren Fallon is set to ride Across The Stars for old ally Sir Michael Stoute in the Derby at Epsom next month. The 51-year-old jockey is enjoying another comeback in Britain and Ireland after a spell in the United States. Across The Stars is owned by Saeed Suhail, for whom Fallon won the Derby on the Stoute-trained Kris Kin in 2003. In other Derby news, top Irish trainer Aidan O'Brien indicated he is likely to run four horses - US Army Ranger, Port Douglas, Deauville and Idaho. US Army Ranger heads the betting for the Classic on 4 June along with Dante Stakes winner Wings Of Desire, the mount of Frankie Dettori for trainer John Gosden. The Dettori-Gosden partnership won last year with Golden Horn, and the trainer was pleased with his leading 2016 contender's workout at Epsom on Tuesday morning. "The horse did it nicely. We had not come here to do a flat-out piece of work, we came here to learn about the track," said Gosden. Dettori added: "To compare him to Golden Horn is a bit unfair. With Golden Horn I had sleepless nights, with this one I just hope for the best." As for Fallon, Suhail's racing manager Bruce Raymond said the owner was pleased to have the six-time champion jockey riding for him. Fallon has won the Derby three times - on Oath (1999) for Henry Cecil, plus Kris Kin and Light Shift (2004) for Stoute. This will be his 12th ride in the race - his last when seventh on the Godolphin-owned True Story two years ago. Across The Stars has won one of his four starts and was most recently seen when finishing third in the Lingfield Derby Trial after a slightly troubled passage. Stoute is also due to saddle the well-touted Ulysses, a son of Epsom Classic winners Galileo and Light Shift, and impressive winner of a maiden race at Newbury on only his third start, on 13 May. Andrea Atzeni has been booked to ride for the Newmarket trainer, who has five Derby winners to his name including Shergar (1981) and Workforce (2010). "He's a real well-balanced, good-actioned athlete with an Epsom pedigree," said Stoute of Ulysses. "He's more mature [than Across The Stars], ready for it and I'm certainly very hopeful of his chance." Ulysses, and US Army Ranger, will bid to become the first Derby winner to begin with the letter U. The victors since the first running in 1780 have represented 23 letters of the alphabet, with X and Z also yet to pass the post first.